A friend and I are putting together a care package for our dear friend (and former university colleague), Becky, who moved to Athens last September after falling in love and marrying a Greek guy. 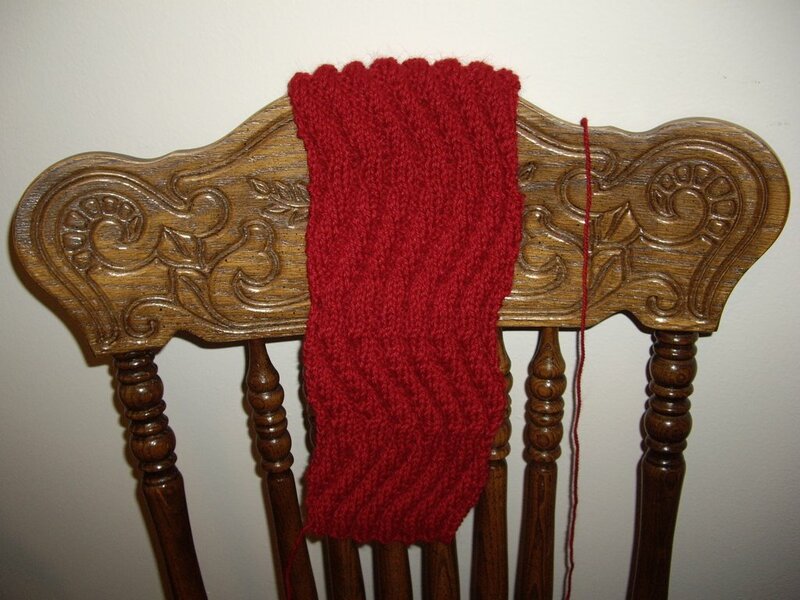 Becky's been complaining about the cold, which surprised me, so I decided to knit her a warm scarf. 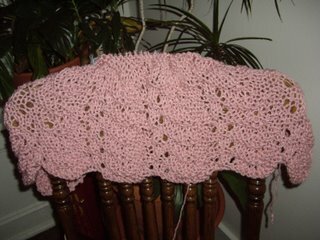 Time is of the essence, here, so it's an easy peasy feather and fan scarf in yummy Malabrigo (Violetas) on size 9 needles. 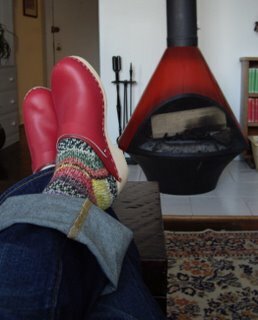 I swiped the idea from Joan, who was inspired by Knitter's Review. It's so cute and versatile. I like the look with the little tank peeking out at the top. A few years ago I had two merino wool sweaters from J Crew in this henley shape, but just stockinette stitch, and I wore them a ton. An added bonus is that the pattern calls for the readily available and fairly reasonably-priced Knit Picks Gloss. There are a few skeins in my stash, but not enough for this sweater. 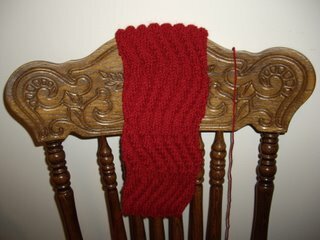 The Elbac scarf in Knitty is cute, too. 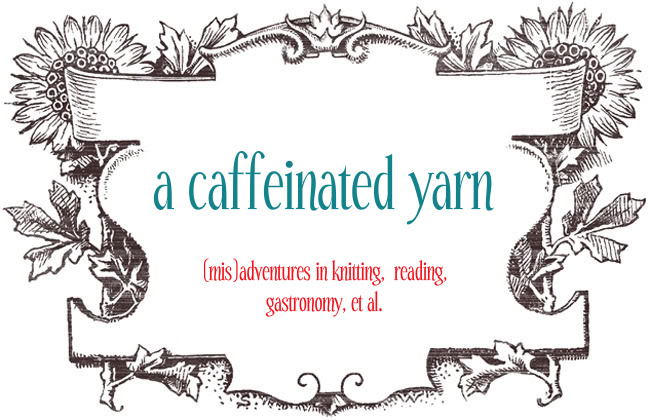 Due to the lovely wintry weather, it has been soup-o-rama chez Caffeinated Yarn lately. 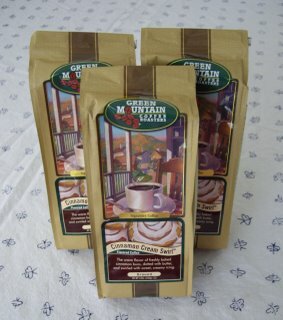 Here's a recipe that was a big hit. 1. In a 6- to 8-qt. pot, heat the olive oil over medium heat. Saute the garlic, onions, and cumin 1o minutes, stirring often. 2. Add the tomatoes with their juice, the stock, salt, and pepper and bring to a boil. 3. Add the carrots and cook 15 minutes, then add the zucchini and cook 5 to 10 minutes, or until the zucchini is tender, not mushy. 4. Add the kidney beans and corn and cook 2 minutes. - Run a hand-held/immersion blender through the stew to chop stuff up a bit. - Remove 2 C. of the stew, puree it in the blender or food processor, then return it to the pot. Taste to adjust the seasoning. If desired, sprinkle on grated cheese before serving. Variations: I sometimes add cooked small shrimp (salad size) to the stew at the very end to give it some extra protein and body. You could do the same with cooked, diced chicken. Slightly adapted from Jeanne Lemlin's Quick Vegetarian Pleasures, a wonderful and versatile cookbook that won a James Beard Award back in the day. My childhood TV-watching days were marked by PBS, the news, and investment shows, not by choice, mind you. My parents didn't set specific TV limits; they just turned off anything that they thought was crap. That translated into pretty much everything. They especially disliked programs with laugh tracks and live studio audiences, so no Cosby Show, Family Ties, etc. So... one thing I did watch often was Mystery! on PBS. 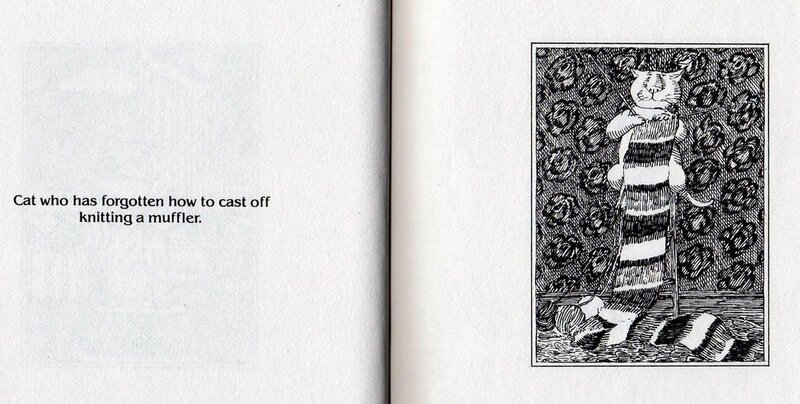 The entrancing Edward Gorey introductory montage was the first thing to draw me in. 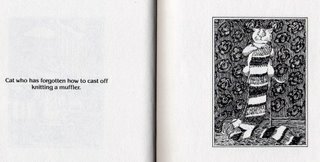 Knowing all of this, Paul surprised me with an enchanting little book that he found at a used bookshop just down the street: Dancing Cats and Neglected Murderesses (1980). I'm jumping on the bandwagon, and doing the weird things meme. I feel as if the sum total of my existence is a bit weird. 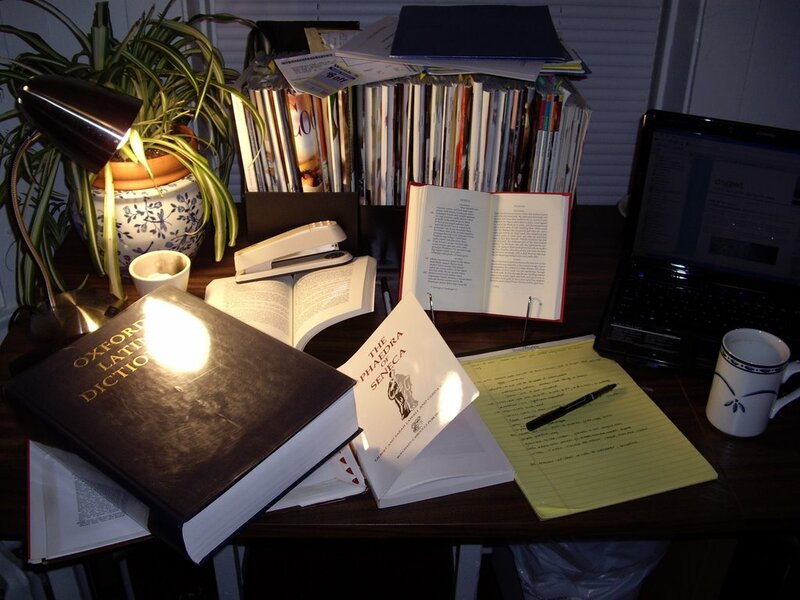 I study Latin and Greek and plan to make a living that way, I knit, and I read voraciously. But we'll give it a shot. 1. 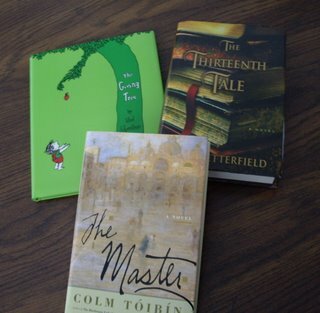 Despite not having any kids, I collect children's books. I'm drawn to ones with unusual, charming, or quaint illustrations. I got started on this because my godmother is related to the Caldecott award-winning illustrator/author Stephen Gammell. I especially like Latin translations of children's books. Not only are they fun, they give me a joyous sense of rebellion every time I wear them. 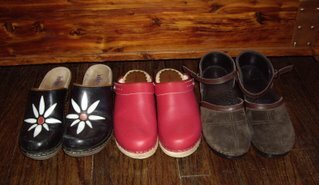 My mother forbade me to wear clogs because they were such an impractical form of footwear, especially for Minnesota winters. 3. I hate summer and hot weather. I love frosty, snowy winters, and I'm happy with spring flowers and autumn leaves. Temperatures over 72 degrees make me absolutely miserable. On a related note, I dislike tropical vacations immensely. I blame my Nordic blood for this one. I also sunburn very easily. 4. I'm afraid of heights. On the other hand, I enjoy hiking and mountains. This can lead to problems, as evidenced by me clinging to the side of the mountain and sobbing during a particularly treacherous stretch of the Garden Wall hike at Glacier National Park. 5. I talk to my cats. That's not so unusual, but I also answer back for them! Methinks that's not a good sign. I also like to give inanimate objects names (my laptop is named Putesy Buttons -- it's a Strong Bad thing), and I say hi to squirrels and bunnies outdoors when no one is looking. Go forth and reveal your six weird things, if you please. 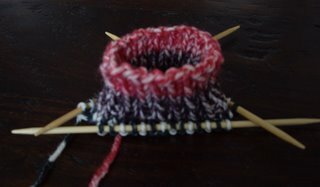 As Bears excitement reached a new level of furor here in Chicago yesterday, I knit up a storm. 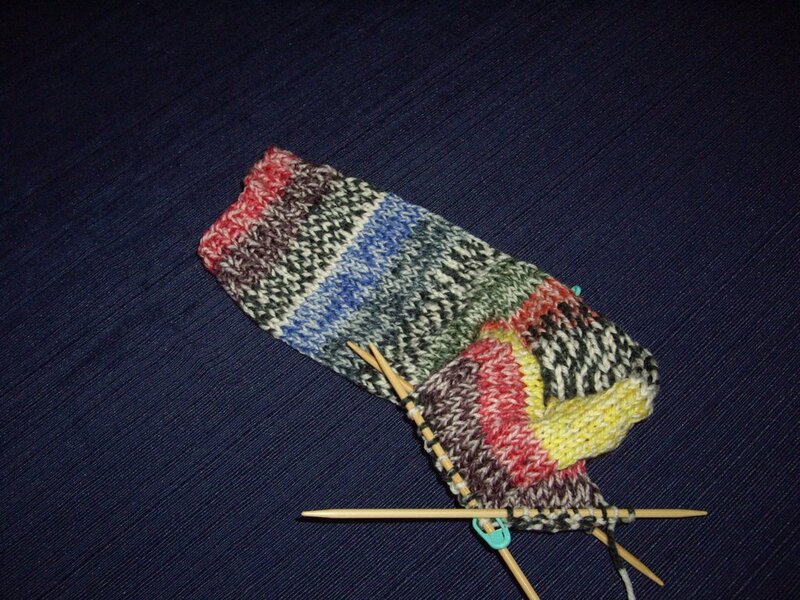 The second sock is coming along quite quickly indeed. I also cast on for a new project, and I am HOOKED. 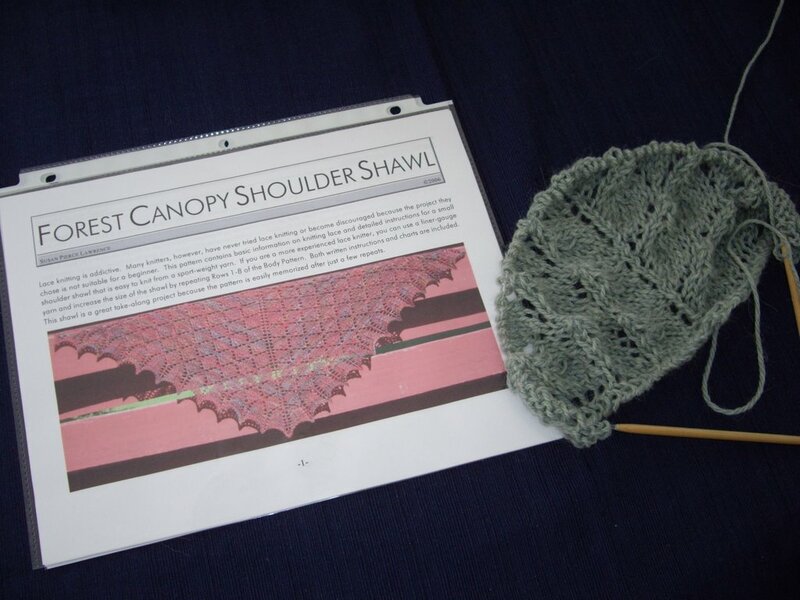 It's the Forest Canopy Shoulder Shawl by Susan Pierce Lawrence. Many beautiful examples out in the blogosphere inspired me. Look here, here, here, and here, just to see a few. The directions are crystal clear, and this whole lace knitting thing is addictive. I've already finished the third pattern repeat. Jared over at Brooklyn Tweed knits the most beautiful shawls, and what I really like about them is the body and weight of them. Plus Jared just plain rocks. 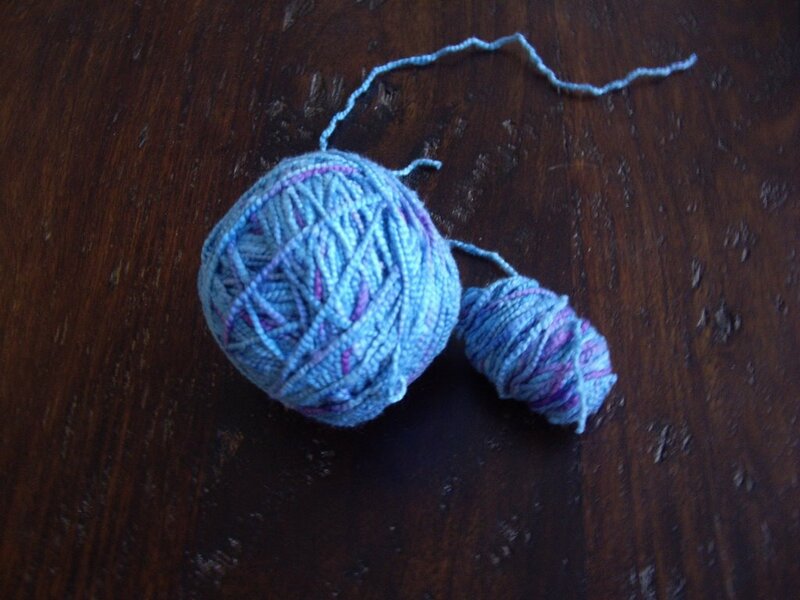 He admits that one of his tricks is to sub in a heavier weight yarn than the pattern calls for. 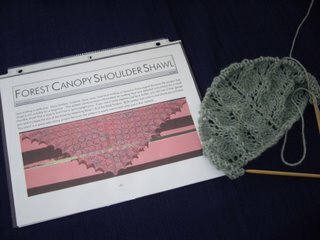 I'm following his lead on this one, and I'm using Alpaca with a Twist's DK-weight Baby Twist in a lovely light heather green instead of a sportweight yarn. It has great yardage (549 yds). I'm using size 8 Clover bamboo circs. These pictures are from a repeat ago or so. It's so difficult to take even halfway decent photos in my kitchen because it is super dark. Every other room has tons of windows. Oh well... today I'm sharing a recipe for Leek and Goat Cheese Focaccia. This is hearty and delicious. I usually serve it with a good winter soup. To begin, I'm including my recipe for making focaccia dough in the breadmaker. 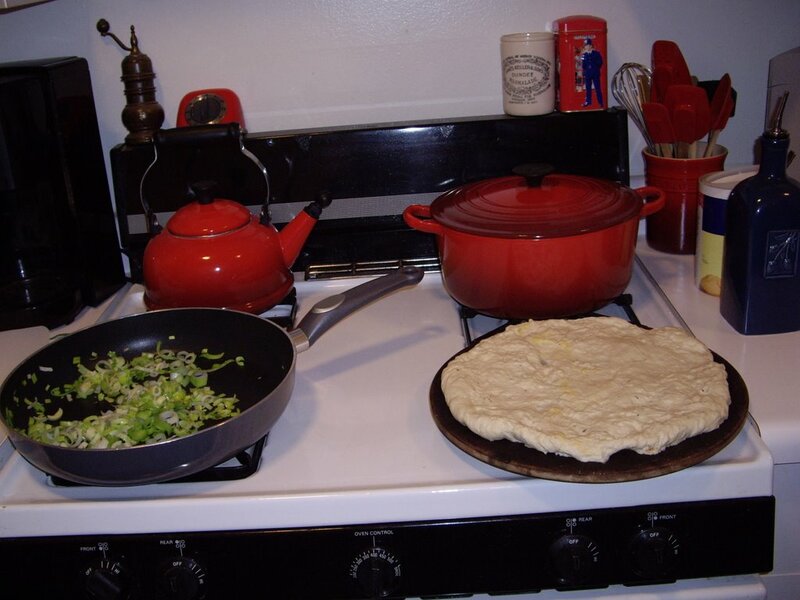 Feel free to substitute frozen bread dough or even a Boboli crust if you're in a hurry. Add all ingredients to bread pan in the order given. Set on "Dough-Only" feature if your Bread Machine is equipped with such a selection. When dough cycle is done (on my machine it takes a little over an hour), remove to floured board. Pat dough into circle about 1/2" or 3/4" thick. Place on a pizza stone dusted with cornmeal. Dimple dough with fingertips. Brush with a little bit of olive oil, if desired, and let rise for 15-20 min. To clean the leeks, make a vertical slit in each along its length through to the back. Rinse under cold running water, flipping through the leaves with your fingers to rid them of all sand and dirt. Thinly slice the leeks, using as much green as possible, but avoiding the extra-thick outer leaves. Heat the 2 tsp. of olive oil in a medium-size skillet over medium heat. Add the leeks and saute until tender, about 10 minutes. Add the cream and salt and pepper to taste and cook 2 minutes more, or just until the cream thickens. Place the thawed dough in a large bowl. Evenly sprinkle on the thyme, then 1 T. of olive oil. Knead until incorporated. You can let it rest after a few minutes of kneading and it will absorb some oil, then knead a bit more. 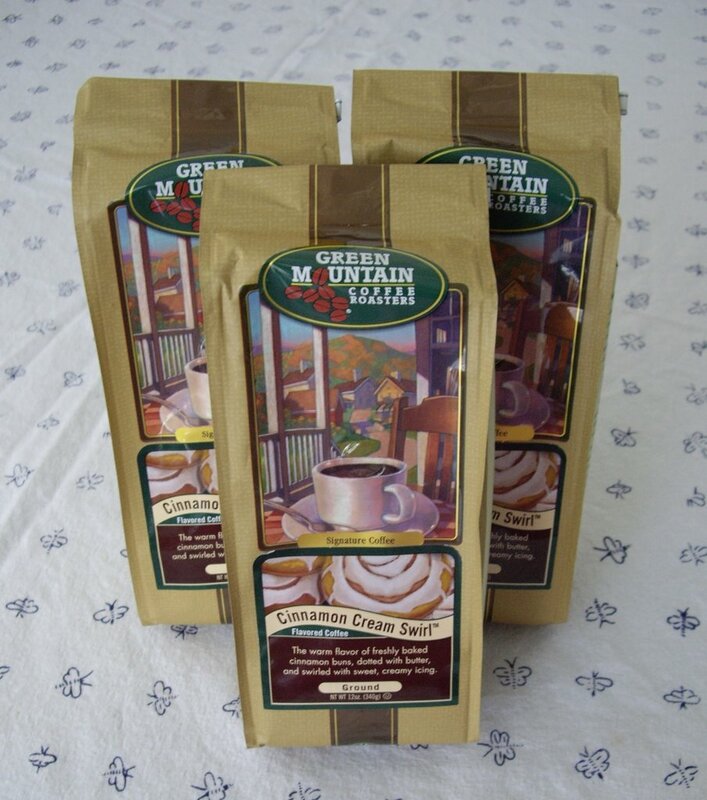 Roll the dough into a 1/2 " to 3/4" thick circle, flouring your work surface as necessary. Place on cornmeal-dusted pizza stone. Bake dough 10 minutes. Remove from the oven, then spread the leeks all over the dough to within 1/2 inch of the edge. Sprinkle on the walnuts. Bake 10 more minutes. Remove from the oven and drop on the pieces of goat cheese. Bake 3 additional minutes, or until golden. Let cool a few minutes before serving. Serve cut into squares. Slightly adapted from Jeanne Lemlin's Main Course Vegetarian Pleasures. Due to the dearth of children around here, Pooh has been enlisted to model the Kitten Hat. It still needs a button for the chin strap. 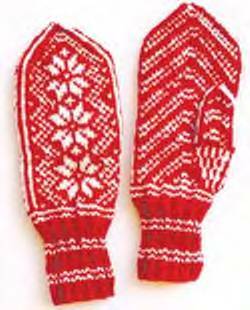 This pattern is very clever, and it was a joy to knit. I wasn't exactly sure how the construction worked until the very end. I really enjoyed the fuzziness and lightness of the Kitten yarn, even though it had a tendency to get a bit tangled up within the confines of the center-pull skein. Wild and Woolly Sock: Why must I be so alone? What have I done to deserve this? Jodi: Not for long, my pretty, not for long. 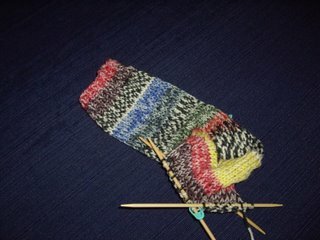 I have begun a mate for my first sock. I'm thinking he'll knit up quickly. 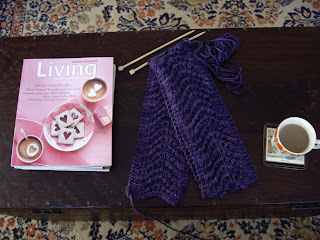 Alas, this sort of stuff has cut into my knitting time quite a bit lately. 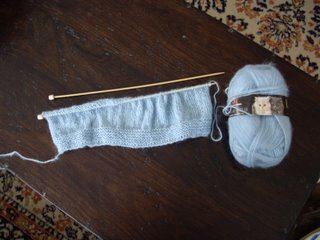 So many knitters complain about mohair, and I'm finally experiencing its joys as well as its frustrations. 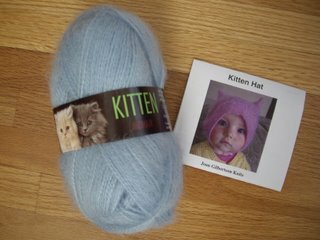 Here's a little kitten baby hat on the needles, knit with Sandnes Garn "Kitten" on size 3 needles. The pattern is by Joan Gilbertson, and so far I have no complaints. I can't find information on her designs online. This hat's cuter than the S&B version, and I love that I'm supporting an independent designer. I bought the pattern at Ingebretsen's in Mpls. It's not listed in their online catalog, but I'm pretty sure they can accommodate requests. 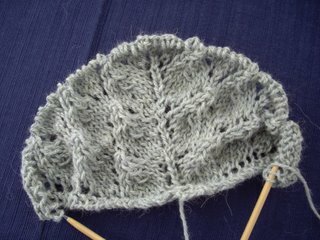 Note to all who might be interested in the Lace-Edged Women's Hat pattern from Head Huggers: the lace edge curls a LOT! Steam blocking it fixes the problem, but who wants to do that every time you wear a hat? 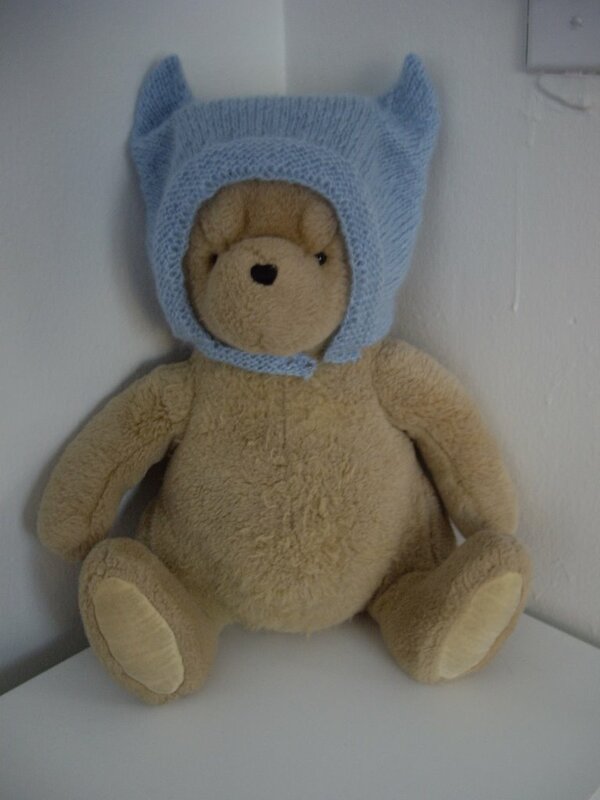 I don't recommend this pattern even though the hat is quite fetching. There's also been some top-secret, unbloggable knitting going on, but you'll just have to wait to see it. Alas, Wavy grows ever so slowly. I caught a fabulous animated short film on PBS the other night. Still Life with Animated Dogs is intelligent, thoughtful, and charming. Paul Fierlinger tells the story of his life and his dogs as he muses on the nature of the world -- human, canine, and otherwise. Two thumbs up! It won a Peabody in 2001. I took advantage of the long weekend and headed to Minnesota for the weekend. Yesterday I visited the Museum of Russian Art. It was a great experience, and the museum space is lovely. There's an outstanding collection of Realist art from the 20th century. The portraits are really interesting. The party line was a rejection of the aristocratic ethos, glorification of the peasant worker, and a turn away from religion. Another great exhibit featured "Scenes from a Russian Winter," and it was so neat to see the winter landscape with its harsh beauty, as well as people adapting to their chilly surroundings and living their lives. I would highly recommend it if you ever make a trip to Minneapolis. My parents have a **s l o w** dial-up connection, so expect blogging to be light over the next couple days. I think my secret pal's gone overboard! Look at what arrived in today's mail. I popped the Etta James CD into the stereo right away (fabulous! 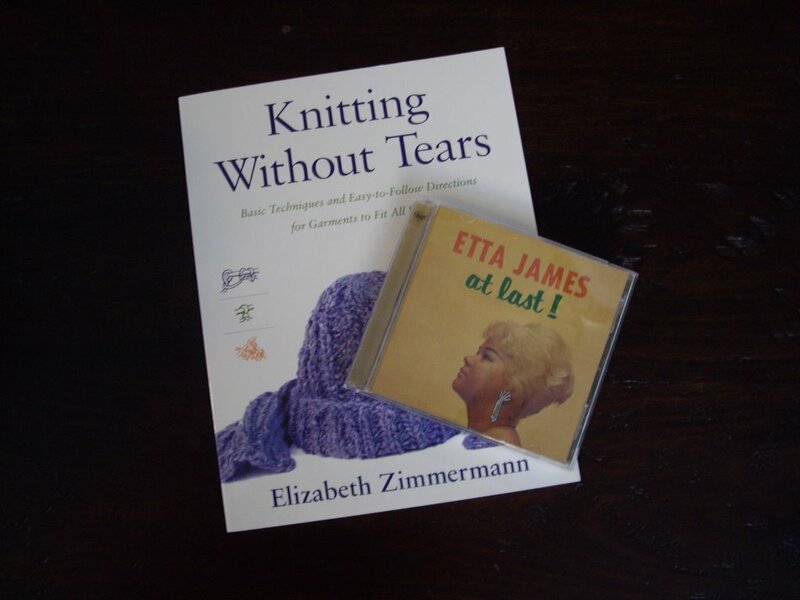 ), and I can't wait to read the EZ book and start knitting some sweaters. Thank you, my thoughtful and generous secret pal. The city of Chicago has put together the Winter Delights Stitching Salon at the downtown Cultural Center. I went to the grand opening event on Friday afternoon, and it was jam packed. The lovely ladies from Lorna's Laces (how's that for alliteration?) held a hands-on dyeing demonstration, and here's the fruit of my labor. A little bright for my taste, but it was fun nonetheless. Why, oh why do I always bind off too loosely? 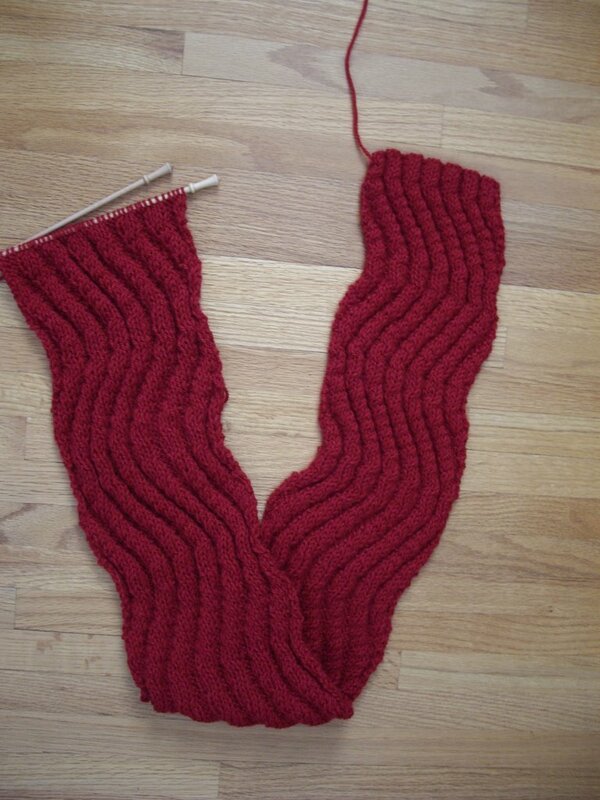 I always take the pattern directions to heart, and I end up with a goofy, wavy-looking bind-off. I've already ripped this back; I'm leaving enough yarn that I can add fringe to camouflage the loose end if it happens again. If anyone has any good tips, feel free to chime in. This is an ongoing problem of mine. I know that blocking helps, but not quite enough. Apparently tulips aren't just my favorite flower; they are Capricha's as well. 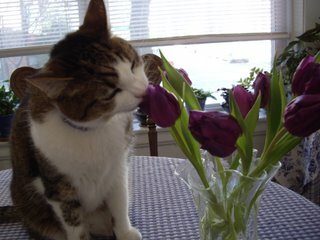 I caught her in the act today and promptly moved the flowers to an area less accessible to felines. 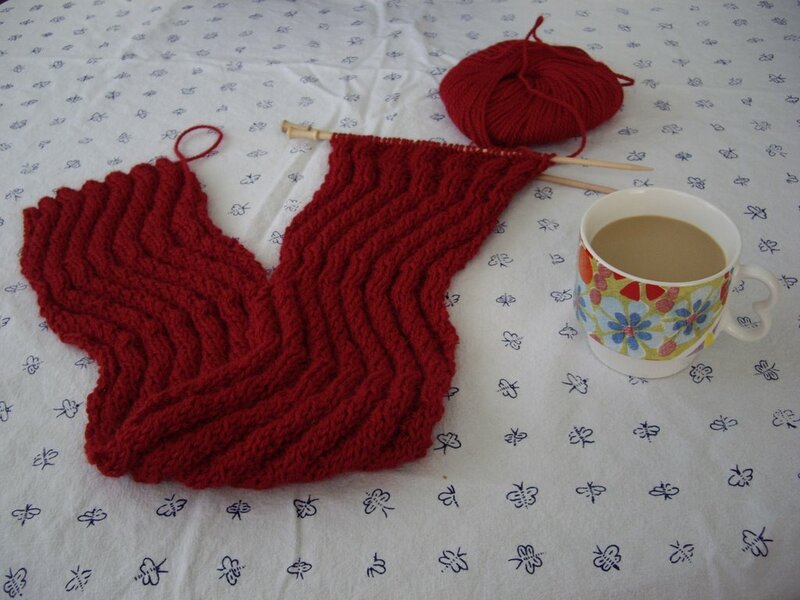 Saturday morning started off quite well with a great cup of coffee (Gloria Jean's chocolate raspberry truffle) and a bit of knitting on Wavy. I like to get up before Paul on Saturdays and have a little quiet time all my own. My new yoga class began on Saturday, and it was great. Somehow it managed to be relaxing, energizing, and challenging. 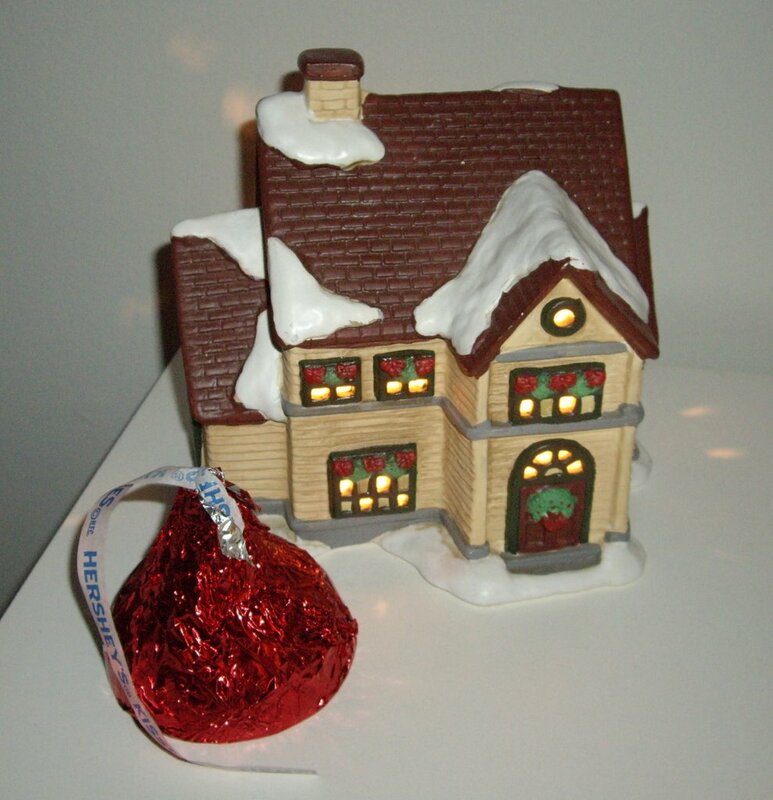 Here's to more healthful living in 2007! I've been a little under the weather lately due to a cold (and subsequent ear infection) that I contracted from cute little baby Emma over New Year's. Hopefully I'll shake this bug and return to knitting up a storm soon. Perhaps because of this Split Enz masterpiece? This is one friggin' amazing music video. Hat tip to Paul. 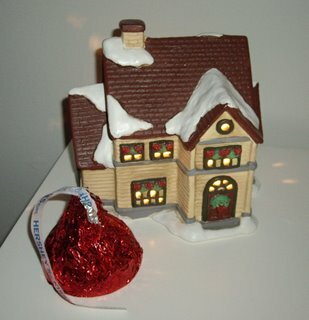 My 10-year old cousin gave me this ENORMOUS Hershey's Kiss for Christmas. That is one solid chunk of chocolate, not exactly what I need to keep up my strength for my New Year's resolution to live more healthfully. 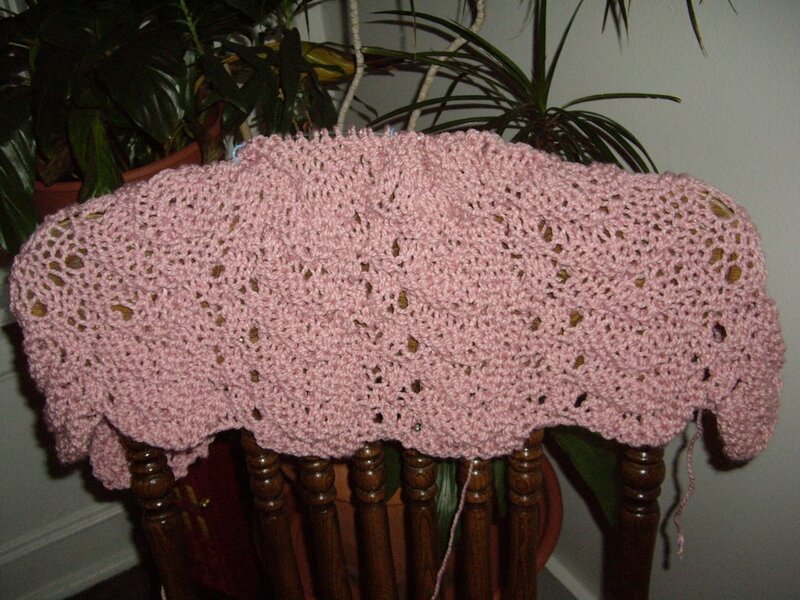 Here's a pink baby blanket for Project Linus. 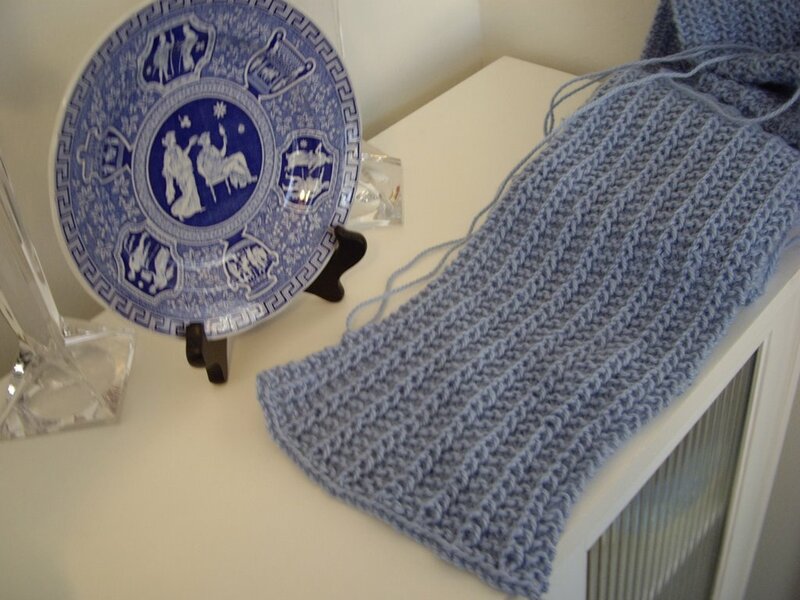 It's just a basic feather and fan pattern with chunky yarn on big needles, and it makes for great TV knitting. Wavy is ever so slowly growing. It's still not my favorite thing to knit, but I think I'll like and use the the end result, so I'll just plug away at it. 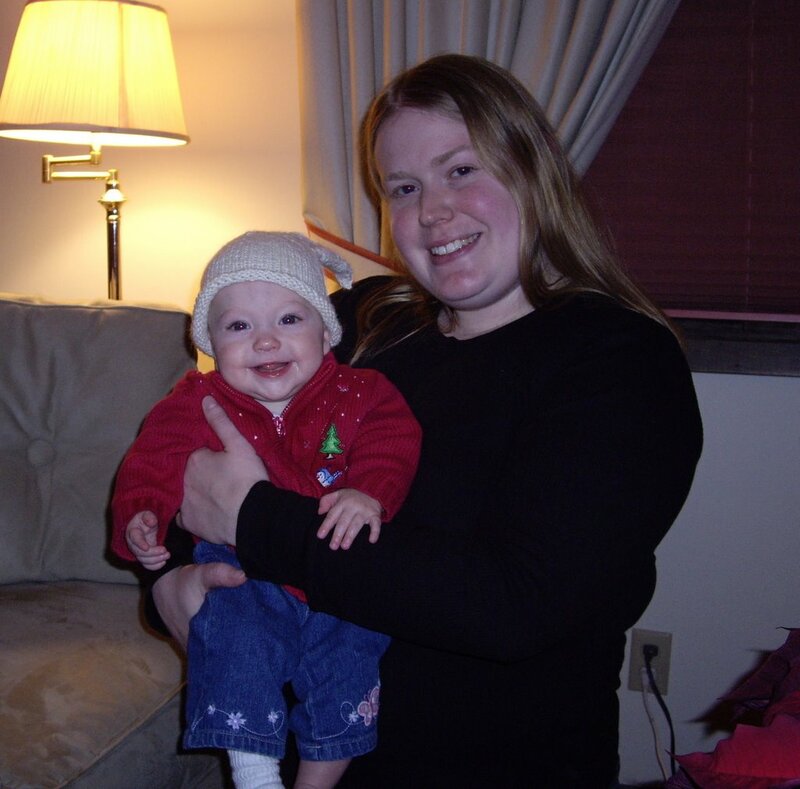 Here I am, holding Baby Emma as she models the bunny beanie that I knit a couple months ago. What a cutie! This hat and the shawl collar sweater from Debbie Bliss's Special Knits for Babies are my 2006 knitting favorites. Old Man Winter came through for me on New Year's Eve, delivering a few inches of snow to the Twin Cities. It made for a great start for 2007. The lake was not frozen solid enough for skating, but there was still a fabulous lakefront fireworks display. I'm back in Chicago now, sadly snowless once again, getting ready for the new quarter to begin. 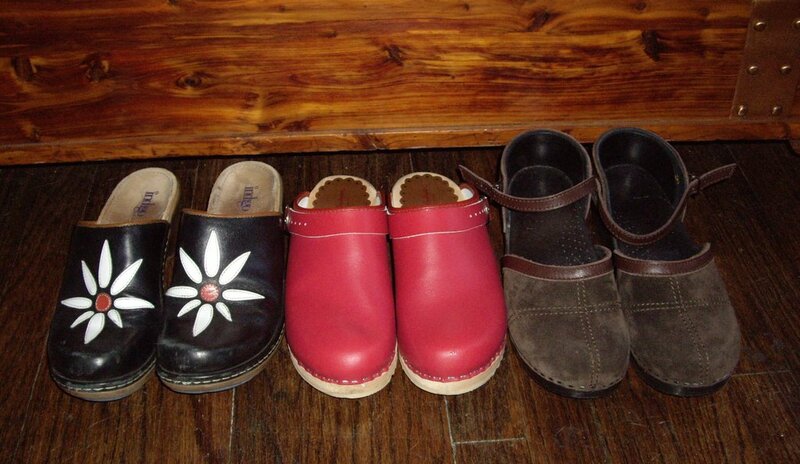 In addition, there are gifts to put away, suitcases to unpack, bathrooms to clean, and groceries to buy.